Dixie PerfecTouch insulated paper cups are used extensively in restaurants, cafeterias, coffee shops and various food service concerns and, being Dixie cups, are one of the most recognized brand of cup anywhere. Used primarily as paper coffee cups, including use in vending machines, their insulation properties are ideal for keeping beverages hot yet protecting users holding hot liquids. These PerfecTouch disposable coffee cups can also be used for keeping cold drinks cold. These insulated cups are available in a variety of sizes ranging from 8-oz, 10-oz and 12-oz to 16-oz and 20-oz. You'll also find lids here to fit these cups. Several graphic designs are available, and cups and lids come in wholesale-priced case lots of 500 or 1000 pieces. 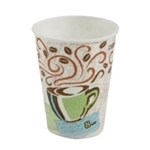 Buy wholesale Perfectouch hot cups from the leader in restaurant supply.